In the classical world Gina has won all the major titles, British Championships Commonwealth Championships and World titles for her accordion playing. Teachers degrees ALCM and LLCM for Piano. 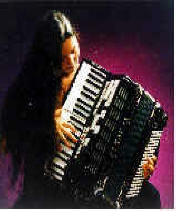 A world acclaimed award for her musicianship was given with the title Golden Master and a title from Italy for her music. There have been major awards presented to Gina and Romany Rye. The stage and television authorities presented them with the Stage Award for best Vocal/instrumental group. Norman has a classically trained voice, trained as a tenor but uses his voice in a commercial register for Gina & Romany Rye, he is a fine vocalist, his repertoire and style have been the talking point of musical critics for many years, who have admired and commented on his wonderful vocal style. Gina and Norman, Gina and Romany Rye, have been together for many years, and have appeared all over the world. On board the Queen Elizabeth 11 for their World Cruises, for Corporate and private events at the Hilton Hotels, Trust House Fortes Hotels, Ladbroke Mercury Hotels. The Royal Garden, Grosvenor and Savoy Hotels in London. They are artistes of true Professional status, and together have achieved all the recognition they deserve from the industry, receiving the highest awards for their musicianship and professionalism. Whatever the mood of your event, the music will always feel right. Whether it be light background music, music to talk to, or music to dance to, it will always be just music to the ears. 1998 Marked the first concert tour of three states, 17 concerts over a 3 week period, and audiences of 16,500 on each of the final two concerts. Nine television appearances on international and national television stations. A resounding success and a repeat of that tour in 1999, 2000, 2001, yet another major success for GINA & ROMANY RYE. A RECORDING WITH 19 TRACKS OF CLASSICAL AND SEMI CLASSICAL MUSIC AND SONGS. 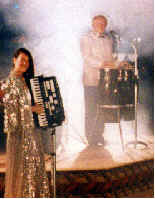 CD PRODUCED FOR THE FIRST LAS VEGAS ACCORDION CONVENTION INCLUDES THE SONG LAS VEGAS, ROGUE RIVER, DIXIE, COTATI, WILLIAMS MUSETTE ETC.